Students completing this program earn a Bachelor of Arts in Culinary Arts. The program provides the necessary knowledge and experience in the field of Culinary Arts and is designed to assist the student in his or her preparation for a rewarding career at the level of managerial positions in the Hospitality and Catering industry. To learn and effectively practice technical skills in food preparation. To develop a professional vocabulary of terms related to food and its preparation. To acquire an in depth culinary education in order to meet the needs of the industry for competent professionals. To develop personal and professional skills needed to succeed, including professional communication, time management, business etiquette, self-awareness and team building. To improve critical and creative thinking skills, such as problem solving, information literacy and quantitative reasoning. 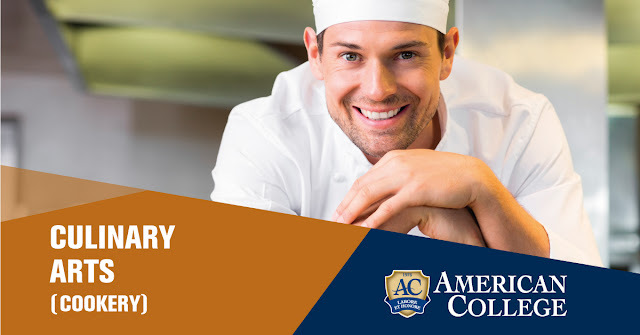 To acquire an in depth knowledge of culinary techniques and prepare for management positions in the Culinary arts industry. To develop critical, evaluation and design competencies in order to structure, operate and manage a Kitchen environment. To acquire and develop the attributes of a managerial-level catering employee, including professional skills, organizational abilities, and food presentation artistry. To learn professional foodservice management principles and applications including: menu development, food costing, purchasing and inventory. To build a foundation in the business aspect of the culinary arts industry, including management techniques, public relations, safety, accounting and human recourse management. To enable graduates to pursue postgraduate studies in the Culinary Arts, Hospitality or Business area. Execute professional cooking techniques needed to produce, present and serve dietary, contemporary, international and quality food utilizing the right ingredients. Develop critical, evaluating and designing competencies, necessary to design and manage a kitchen environment. Evaluate current controversies in the area of food science. Acquire a supervisory training experience within the catering industry putting theory into practice. Apply the major concepts, skills and values of the food service management profession to address industry problems both domestically and globally. Pursue further studies in related fields. The number of credits carried by each course is shown in the parenthesis following the course title. During summer vacation periods (1 June to 30 September) Culinary Arts students have the opportunity to undertake training in the thriving hotel and tourism industry in Cyprus, thus supplementing their education with real hands-on, paid experience.